Rev Sue and her husband Malcolm moved into The Old Baptist Hall which is the new manse in November 2018 and have now settled in. We continue to thank God for all he has done and will do in our community in the future. Unfortunately due to Malcolm’s ill health this year we will not be able to provide Christmas Day lunch as usual but hopefully it will be back on the menu in 2019. Thanks to all who came and the musicians for making it an enjoyable evening. 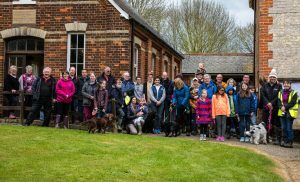 Easter Monday Walk – April 2nd arrive at church from 10.30am to start walk at 11am, 3 and a bit miles around Great Sampford followed by lunch about 12.30pm in the church hall of jacket potato, cheese and beans plus a pudding. If you can let us know numbers for lunch that would be helpful, donations towards lunch and the support of our building project appreciated but there is no obligation, we just look forward to seeing you. Thanks to everyone who came on the walk with us even though it was a very muddy one. I think I can say it was enjoyed by all, especially the dogs. Lunch was enjoyed by walkers and non walkers alike and my thanks to those who prepared it. Many thanks to Chas and his friends who gave us an evening full of fun and entertainment as they had promised, it was a fantastic evening enjoyed by many and we raised just over £200 for the church roof. 1st May Bank Holiday Monday – Paul Williams Memorial Walk – This is a sponsored walk of just over 3 miles around the village of Great Sampford in memory of Paul. Meeting at the church from 10.30am to begin the walk at 11am. Upon our return we will have a buffet lunch in the church hall. Posters and sponsor forms now available soon, well behaved dogs welcome too. We are aiming to raise money towards a new roof for the church which we desperately need especially before next winter. 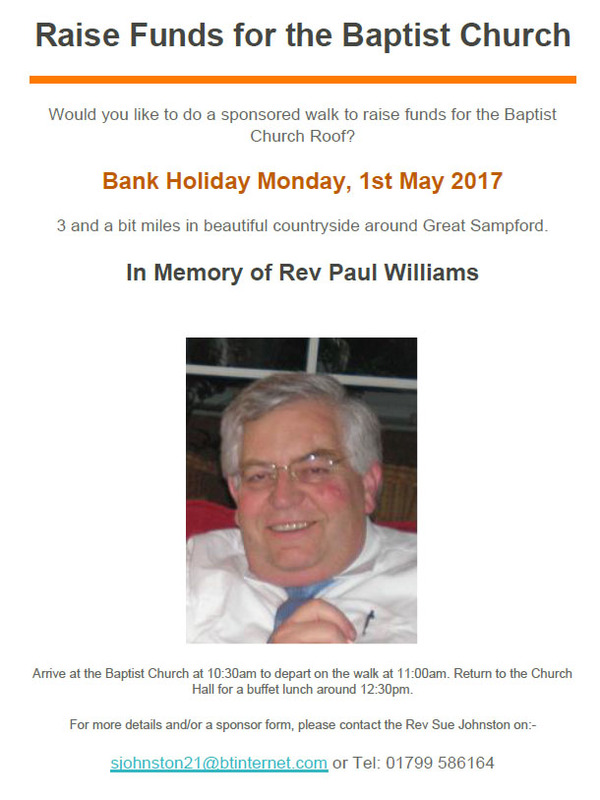 On the 1st May Bank Holiday Monday we had the Paul Williams Memorial walk – This was a sponsored walk of just over 3 miles around the village of Great Sampford in memory of Paul. Meeting at the church from 10.30am we began the walk at 11am. Upon our return we had a buffet lunch in the church hall. We are raising money towards a new roof for the church, which we desperately need, especially before next winter. Thanks to everyone who contributed to the sponsored walk, whether you came and walked with us and raised your own sponsorship money, sponsored someone who was walking, supplied food or was at the church getting it ready for the return of the walkers, we thank you all. It was a great Bank Holiday Monday walk, the rain held off and over 40 people, men, women and children turned out as well as 5 very well behaved dogs and then we sat down to lunch together. Paul would have enjoyed it greatly if he had been there, especially the lunch. ‘Rev Sue Johnston took on a 5 day challenge to raise money for the Baptist Chapel in Great Sampford from the 21st until the 25th June 2016. Her challenge consisted of working around the village during the week. First in Moor End Stables, then at Goldstones Garage, followed by Great Sampford Primary School, Salix Farm and then The Red Lion to complete her challenge. There she was pulling pints behind the bar. Our thanks to those who gave support the final total raised was just over £5000 for which we give thanks to God.